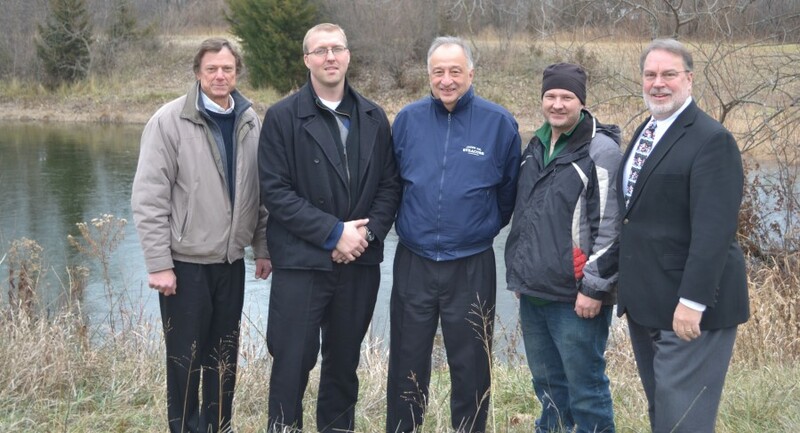 From left at the property are Bob Smith, Syracuse-Wawasee Rotary Charitable Foundation Inc. president; Erick Leffler, Syracuse-Wawasee Rotary Club president; Henry DeJulia, town manager; Jonsson; and Dr. Tom Edington, Syracuse-Wawasee Park Foundation president. A property located off West Wildwood Drive is now officially owned by the town of Syracuse after it was donated to the town by the Syracuse-Wawasee Park Foundation Monday. Previously, the park foundation had purchased the land from the Syracuse-Wawasee Rotary Charitable Foundation Inc. Nov. 20. Park Superintendent Chad Jonsson stated the property is a wide open slate and the town hopes to put together a small committee to look into the different possibilities.